I’m slowly working through all the old books on my bookshelf—the ones I remember reading and liking as a kid, but haven’t reread in years, and which I don’t quite want to put out for adoption without making doubly sure I’m not going to miss them. The upside of this project is that it’s lent me all sorts of fodder for Throwback Thursdays, and this week’s topic was yet another one of these keep-it-or-donate-it quandaries. Before beginning to reread it, all I could I remember about Which Witch? by Eva Ibbotson was that it was about seven witches competing for a wizard’s hand in marriage. Upon rereading it, I did find it goofy, dark, and fun, but I’ve got mixed feelings about the messages it sends. 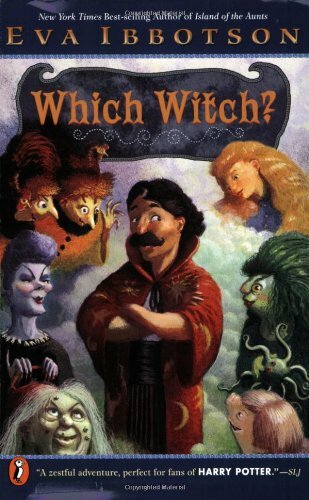 Which Witch?’s story kicks off with the highly successful Wizard of the North, Arriman the Awful, deciding he’s tired of his job. He searches high and low for a successor, but one never turns up, and so he is convinced by his staff that the next best option is to marry a witch and conceive a successor of his own. Because of his loyalty to his hometown, he insists that he marry a local witch, but the seven options available to him are not exactly hot stuff. Dismayed but determined, he decides that whichever of them can cast the blackest magic in a Miss Universe-esque competition will be the one he weds. While Arriman gets the wheels of the plot turning, he’s not actually our protagonist. That honor goes to Belladonna, one of the seven witches. Belladonna falls hopelessly in love with Arriman upon meeting him and being invited to compete, but she’s handicapped by the fact that she’s never successfully cast dark magic in her life. Her magic is so white that birds nest in her hair and flowers grow where she walks, and it’s a source of constant embarrassment and shame for her amidst the rest of the local coven. When she meets a young boy named Terrence at a local orphanage, she accidentally casts a—not black spell, but a decidedly grey one, on the orphanage matron, and decides that Terrence’s pet worm, which she was holding at the time, is a powerful dark familiar, and Terrence and the worm come along to the competition to help her out. Sabotage and chaos abound amongst the six other competitors, though, and if Belladonna’s gonna get her man she’s going to have to successfully pull off one of the blackest spells known to magic. Somewhat like when I read The Witches, I was surprised at how unabashedly dark this book was, while still retaining a very Douglas Adams-like sense of humor. The story will bounce from a comically off-the-wall simile on one page to a witch casting a spell that summons thousands of rats who then turn on and eat each other on the next page. On one hand, I like that, in the end, Terrence turns out to be the successor that Arriman was looking for, because it means that, after a whole story of Belladonna fearing she was a disappointment or that she wouldn’t be able to live up to expectations, that she was no longer responsible for producing an heir to Arriman’s legacy and could just marry him and let come what may. On the other hand, it means that everyone gets what they want without any real character growth or development along the way. Belladonna considers her white magic an embarrassment and it’s treated as such from pretty much anyone she meets in the story, but for the reader it’s hard to identify with her problem. It’s a bit of levity for the book, and within the universe, where dark magic is what impresses people, she is at a disadvantage. However, from outside, it’s also like a reverse oppression situation – oh, how terrible it must be for this beautiful blonde girl who heals baby bunnies and leaves a trail of begonias when she walks because she’s just so not evil. I don’t know that a reader could really look at her and say ‘man, as someone who lacks privilege in their community, Belladonna’s story really resonates with me’. Witch Witch? was a cute read, and at less than 250 pages, a pleasant way to spend an afternoon, but I think it’s safe to say that it’ll be going in my donation pile now that I’ve revisited it. I enjoyed the situational comedy and the humor of the narration, but in the end I didn’t love the plot enough to keep it around. This entry was posted in Books, Fantasy, opinion, Throwback Thursdays and tagged arriman the awful, belladonna, Eva Ibbotson, Throwback Thursday, which witch by Lady Saika. Bookmark the permalink. I had this confused with Ibbotson’s “Not Just a Witch” (I think), so I was verrrrry confused when you started summarizing! I think that one had more of an arc.